Before getting int the post i would like to thank all my blogger friends, readers & subscribers & each and every person who visit Spicy Treats for your constant support & motivating me with your comments, suggestions & feedback. My heartfelt thanks to everyone and hope you will extend your support in the future coming days also. 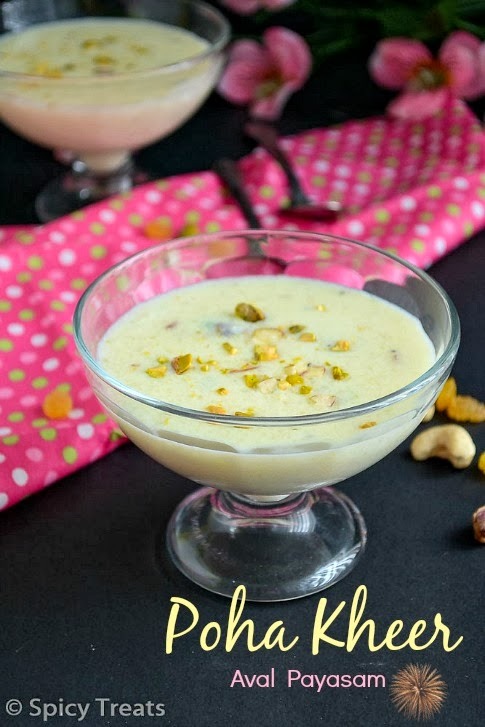 Now coming to the recipe Aval Payasam, is a quick and easy to make dessert or Indian sweet that is made using poha/aval or rice flakes. 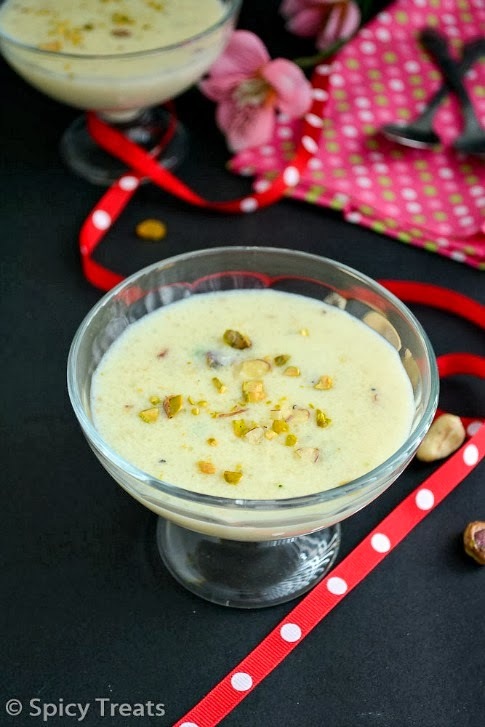 This payasam need just 4 main ingredients and can be made in 30 minutes or less. Heat 1/2 tsp oil or ghee in a pan, add poha and roast for 1-2 minutes in low-medium heat then transfer to a blender and pulse it for few seconds and keep aside. Then add 3 cups of milk in a sauce pan and bring it to boil, once it starts boiling add coarsely blended poha and saffron strands and stir well. And allow to cook poha - milk in medium heat and keep stirring constantly for 5-6 minutes. Once the poha gets cooked milk will turn slightly thick and now add sugar and stir well and cook for another 2 minutes. After that add cardamom powder, soaked and drained raisins and crushed nuts stir well and switch off the stove. That's it...Delicious Aval Payasam ready. Serve Warm or chilled. 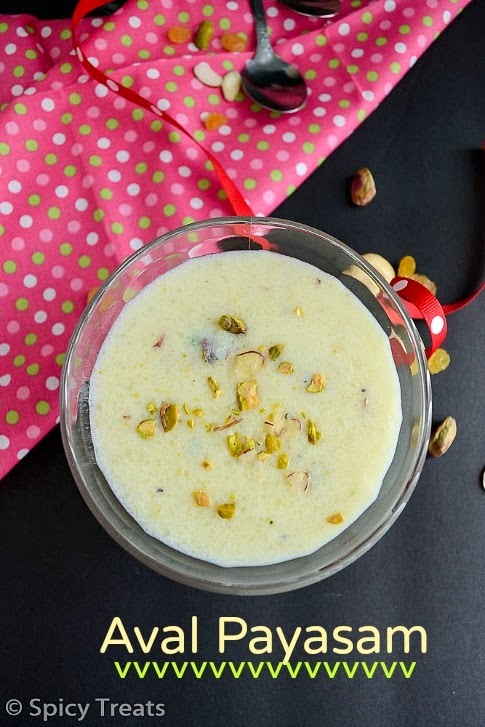 You can make payasam with 2 and 1/2 cups of milk and later add the remaining 1/2 cup of milk when it gets thicken after cooling. No need to grind the poha to a smooth powder, just pulse it for few seconds..that is enough. 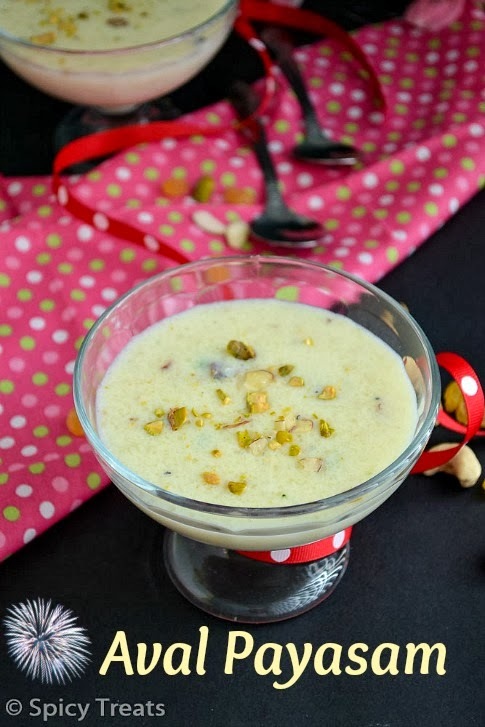 If you like you can also add ghee roasted nuts and raisins to the payasam. I just heat the milk and add poha to it, since its a pasteurized milk no need to boil it. Once Again a Very Happy New Year Wishes To you all !! 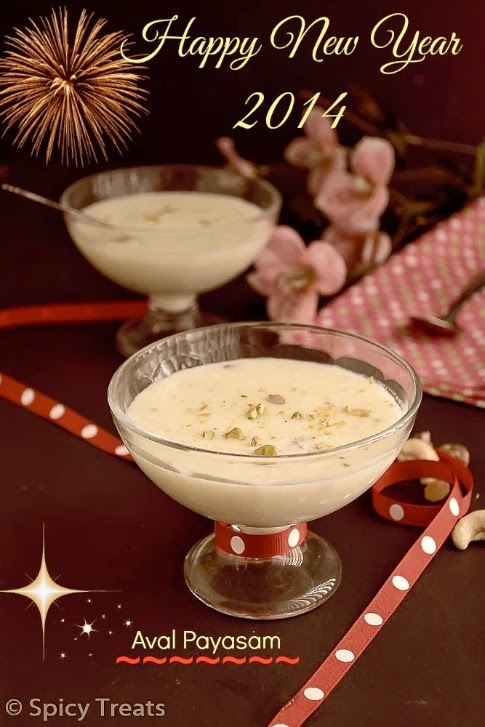 happy new yr to u too..
very yummy kheer. Perfect post for new year. Nice and healthy!! Wonderful way to start the new year.....Wishing you a very happy new year 2014!! 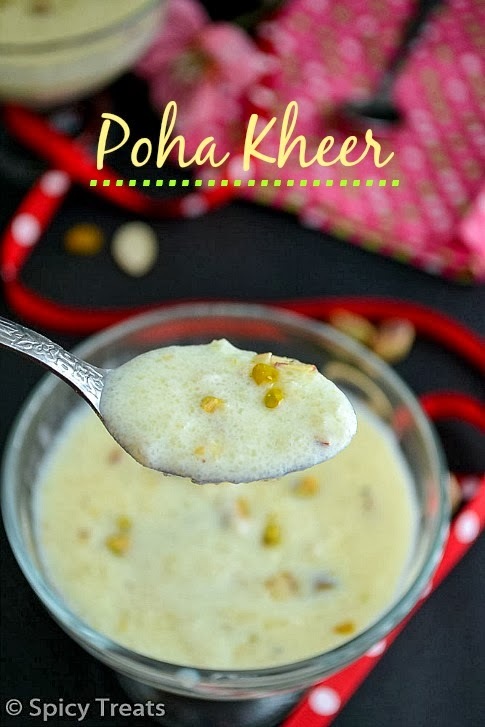 such creamy yummy payasam... slurp!!! Happy New Year Sangee. 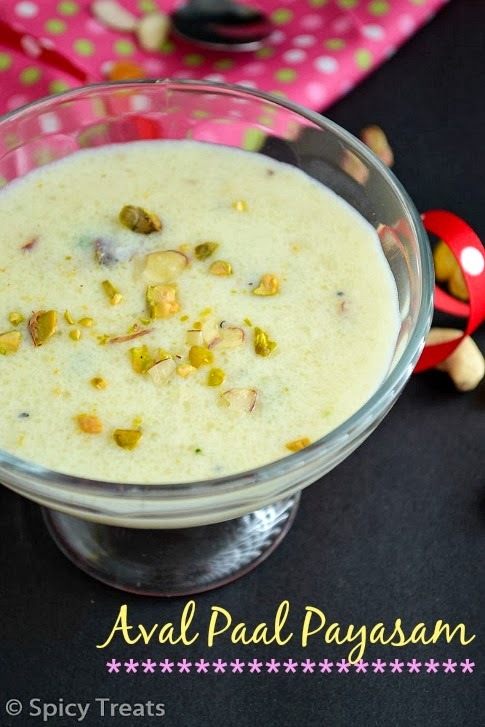 Sweet payasam for the sweet start. Wish you to come up with more n more delicious and innovative recipes for this year. hmm u crush the aval n do the kheer ...Love any sweet any time ....Lovely clicks sangee ..Happy new year to u n ur family..